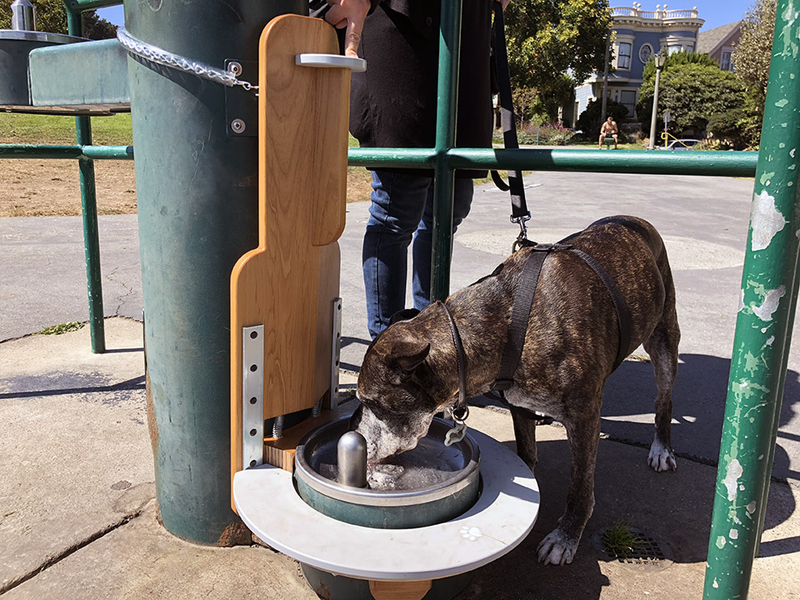 A new, accessibility-minded addition to a dog water fountain recently appeared in the northwest corner of the off-leash area at Duboce Park. Hoodline tipster Ashley N. first alerted us to the installation, which she described as "so cool." 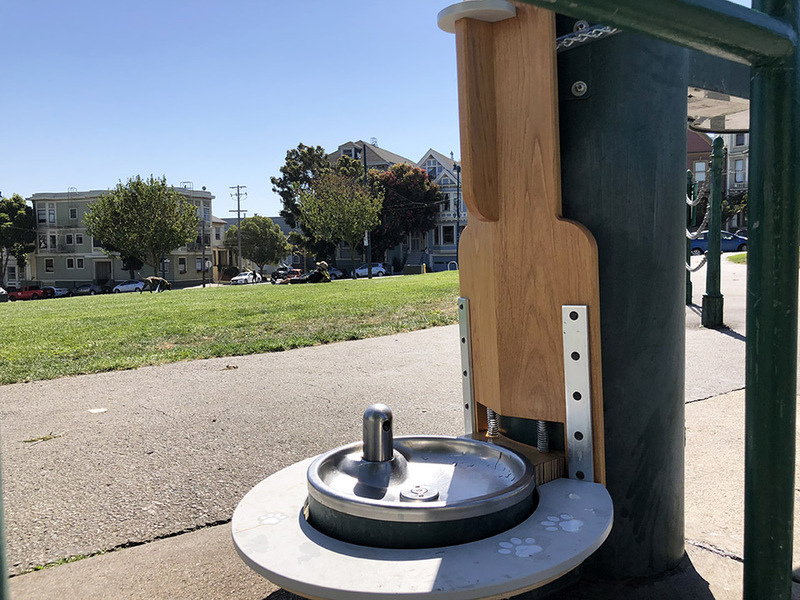 Made of wood, the installation replaces a single metal button that causes water to flow into the fountain's dog bowl, but was "quite hard to push," dog walker and regular Duboce Park visitor Shasta told us. Hoodline met Shasta on a visit to the park, where she was using the fountain with one of her clients, senior dog Sugar. Thanks to artist/designer Michael Oluwasegun Odunikan, spry dogs can now tap the lower part of the installation with their paws to allow water to flow, while older canines like Sugar can have their human companions assist by pressing down the upper part. "I captured a video of a dog who used it all by himself," Odunikan told Hoodline joyfully when we met him at the park. He said that some dogs will figure it out by themselves, and some might require some training and time to get used to it. "The dogs will also learn from each other," he said. When Odunikan, who lives across the street from Duboce Park, isn't busy supporting students as a computer-aided design tutor in the Department of Engineering and Technology at San Francisco City College, he enjoys watching dogs play at the park. "I don't have one myself," he said. Odunikan uses a motorized wheelchair, and a recurring challenge for him was that people like to hang out at the far east end of the park, while their dogs run up to the water fountain in the northwestern corner for a drink. "The dogs looked at me for assistance, but I wasn't able to press the button," Odunikan explained. Now, he can either watch the dogs activate it with their paws, or gently push the new button himself. "It's more accessible for everyone now," he said. Odunikan said he designed the installation to be waterproof, and a fellow Lower Haight resident, Stephen, was responsible for the fabrication. The fountain is actually Odunikan's third prototype, as a previous one was jiggling sideways. He brings it to the park every morning and picks it up every evening, to make sure it's not vandalized. When Odunikan posted about the project on Nextdoor, he received a lot of positive feedback, he said, adding that someone even requested it for Dolores Park. He told us that he would be open to the idea of testing the addition to water fountains in other parks across the city. Duboce Triangle resident and dog owner Sam, who checked out the fountain during Hoodline's visit, says it's a nice addition. "I'm excited to find out what my dog will do, but she hasn't seen it yet," she said. Thanks to tipster Ashley N. See something interesting while you're out and about? Text Hoodline and we'll try to find out what's going on: (415) 200-3233.